Having spent just over a week in Laos I can safely say that this really is a fantastic country. Started off spending a night in vientienne (the capital) which was pretty quiet, apart from one of the local girls in the bar we were in, telling me that I am very handsome man before following this statement up with 'No money, no honey'!! 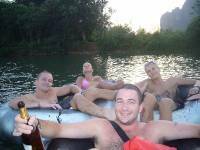 After Vientienne we headed for Vang Vieng which is quality. It's a tiny little town in the middle of Laos with a row of bars and a river - all the bars have "special menus" where you can buy Opium, Marajuana and Mushroom shakes, needless to say there were a few wasted people knocking around. On our second day there we headed for the river where we were supplied with an inflated tyre inner tube, pushed out and started our float down. Along the way there are a load of bars where we stopped off for a few beers and a go on the rope swings. I decided to have a go on the highest rope swing first and gracefully belly-flopped balls first into the river about 10 metres below, screamed quite loudly and ran back to my beer to numb the pain. However once over the agony I must say that 5 hours of floating down a river, drinking beer was one of the most stressful Mondays I've ever had!! The next day we headed for a few caves and a blue lagoon for a swim followed by another day of Tubing and a few pretty heavy nights out. I'm currently in Luang Prabang which is another nice town close to the north of the country with a pretty amazing waterfall about 30k outside of it. The town is pretty relaxed and everything closes at 11.30 - probably due to the fact that the Laos people are incredibly chilled out and unbelievably friendly. Think I'll be having one more day here before heading to Chaing Mai in Northern Thailand. Happy Days! !